This spacious newly remodeled 2 bedroom/1 bath apartment is located 10 minutes from town. While conveniently located, it is on the edge of a birch forest, giving you the feel of being in the wilderness. You can see for miles from the living room and the master bedroom...a panoramic vista of Fairbanks, the Tanana Valley and the Alaska Range! You will be above the city lights and can view the Aurora from your private deck, living room window or in the outdoor hot tub. This property is located on the Scarland trails. You can hike, ski, or bike for miles from right outside your door. We can usually accommodate early check in and late check out with no extra charge if you let us know in advance. The apartment is on the 2nd floor, so you must be able to walk up and down one flight of stairs. Russ and Margaret have lived in Fairbanks for over 40 years. Russ is a retired fire fighter and Margaret is a retired art teacher. Together they have many stories of their adventures in the frozen north. We fell in love with this property because of the view, the easy access to hiking, cross country skiing, biking and the beautiful gardens. We had lived in Fairbanks for many years and yearned to be in the hills where it is quiet, the aurora is not masked by city lights and the winter temperatures are much warmer. This property is perfect. It only takes 10 minutes to get to town, yet it feels like we are very rural. We love the trails that are right outside our door as we are avid outdoors people. We also enjoy watching the wildlife that live in the area with us. Parking is plentiful and the main house has all the right spaces. We live on the top 2 floors and have turned the lower level into Margaret's art studio/classroom. There she paints and creates glasswork for Two Street Gallery in Fairbanks, and Stephan Gallery in Anchorage. She is often available for a tour if you are interested. Bathtub with a shower. Lots of linens. Easy access to downtown, the university, and many attractions. This beautiful property is located in the hills above Fairbanks where you get exceptional views of the aurora, the mountains and the city. You won't find a better view in the area! On a clear sunny day you can not only see all the way to the Alaska Range, but you get a view of Denali. Large parking area with plug-ins for 2 cars. Garage space for one car in the winter months. Brand new stainless steel gas range. This apartment is stocked with coffee, tea and basic condiments. Everything you need to whip up a gourmet meal is provided for you. Breakfast bar seats 4 or enjoy the view while sipping your coffee, or savoring your dinner on the dining table in front of the window. Close to the Chena River where you can rent canoes or kayaks. Private deck with BBQ grill. 30 minutes from Skiiland or Moose Mountain, the local ski areas. Fairbanks Golf course just 5 minutes away. So much like home we even. baked bread here! We had a great stay here. The apartment was spacious and well stocked, and had enough room for myself and my husband as well as his 80 year old parents. There was a hot tub to use, and the kitchen was so well stocked we made paella and baked fresh bread here. Loved the artist touches, art painted by the homeowner! Sadly, we didn't get to see the northern lights while we were here, but we will definitely choose this place when we come back. The accommodations were above expectations, and the hosts were extremely welcoming and friendly, even brushing snow off our vehicle one morning. The views were everything the pictures promised, and soaking in the hot tub with that view was soooo relaxing. An amazing experience overall -- far enough away from town to feel a bit isolated, but still only a few minutes away from all services, stores, etc. Margaret's artwork was a great touch... she has a flair for sure! We would absolutely stay again! Comfy & clean apartment with a well stocked kitchenette, friendly hosts and great views. We enjoyed our stay in Fairbanks and highly recommend this gem in the birch forest to those travelers who have a car. Thank you for sharing your home. Although in a residential area, the property has enough property and trees that you are quite secluded. 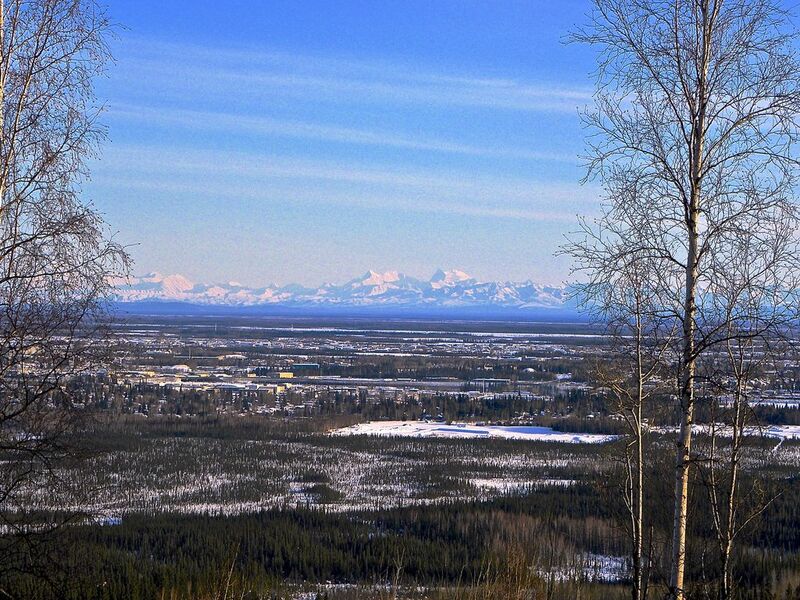 The view is like they show on the web, very nice, facing South over looking Fairbanks. The place is clean and roomy. There are steps to go up, but not a problem if you can do steps. We were there in the winter and had no problem. Your only a short drive to the town below. We were impressed with the apartment. It had a wonderful view and was quite comfortable. Although the northern lights were turned off during our stay, we had a great time. There were things to do in Fairbanks, and Margaret and Russell gave us several ideas . The apartment is very comfortable and it was nice to just relax. There were plenty of amenities in the apartment. Beautiful place. Russ was helpful and super nice.